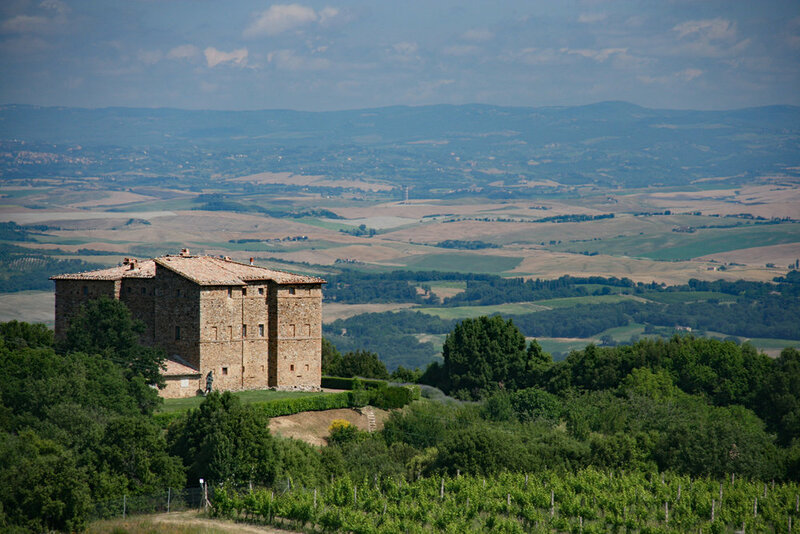 Among your everyday wines, Castello Romitorio’s portfolio has a Rosso di Montalcino, which is done in a baby-Brunello style, and an easy Chianti Colli Senesi. Where does the basic Morellino fit in? If I had to really simplify it, I’d say that my entry-level Morellino di Scansano, the so-called blue label, is a wine that’s very versatile, with very silky, almost nonexistent tannins. It can be served at cellar temperature or a little less; in Japan they serve it at 17ºC, just like a white wine. I hate to say it, but they do. It’s so versatile. In comparison to the Chianti Colli Senesi, which would be my parallel, it’s modern. The reason why is because it’s fruit driven and has a slightly lower acidity than my Chianti Colli Senesi, which is 100 percent sangiovese from Montalcino. [The Chianti] has more transparent colors and a warmer red, because it doesn’t have the cabernet sauvignon in it. So I have my traditional entry-level and my modern entry-level. That’s the simple, simple explanation. Is Morellino more fruit-driven because of its proximity to the sea and a hotter climate? Yes. The more inland you get, the colder the nights get and the bigger the seeds get. The bigger the seeds, the more tannin you get. Instead when it’s hot and by the sea, the skin gets thick to protect itself, instead of the seed getting big. So you have much more color than tannins by the sea. That’s the general rule. But tannins are also in the skin. If the skins are thicker, wouldn’t that produce more tannin? Yes, but it’s the bitter tannin in the seed that dries your mouth and allows for a long-aging wine. What we do in Montalcino is try to have wines with big seeds, really thin skins, and very little pulp, so it’s very structured with lots of tannin, so you can age it for many years. Instead, in Morellino di Scansano, you want very little stem, which also gives that green tannin. For wines you want to sell early, you want them to be clean, fruit-driven and not too tannic. That’s what Scansano does. And since the nights are a little less cold, the fruit naturally has less acidity than in Montalcino. Vinitaly's recent Morellino tasting in New York showed up the two side to Morellino: the more powerful style you mentioned, but also the simpler style that’s done without oak, is released just a few months after harvest, and is utterly charming. Almost like a Beaujeaulois Village. Yes. But you don’t see these imported into the US so much. Just as in Piedmont, there are simple, charming Dolcettos made, but you don’t see them in the States either. Instead, they tend to import the more structured—and more expensive—styles. Absolutely. That simpler style is actually a return to old-school Morellino, a style that used to be consumed by Romans during the summer. It should never be too alcoholic. The yields were very high, so you were able to maintain an elegant, fresh, fruit-driven wine that should be drunk in the first three or four years. Most people were farming in the valleys. Now what some of the boutique guys did was start going up on the hills, planting vineyards that are built to produce a little less yield. There’s 150 meters different, but on those hills there’s also prehistoric riverbeds and quite a different terrain. There are three or four different earths in Scansano. One is the very famous black [volcanic] earth. There’s the red [clay] earth. There’s stony, riverbed earth, like you find in Rhone, where there’s only little round pebbles. Then there’s the very organic valley earth, which is where most people were planting before, because it’s harder to plant on the cliffs. On the cliffs, people were mostly planting wheat. What we and others have done in the past 10 to 15 years is plant vineyards on those cliffs. So they have all the benefits of the warmer coastal climate and so forth, but it’s slightly cooler at night, which permits lower yields, therefore higher alcohol, therefore more structure, and therefore an expression to the maximum of what the territory can give. Over the next 10 years [as the vines mature], we’ll see increasingly greater wines coming from those vineyards. At the same time, we’ll also have what I think should be considered the worldwide image of the Morellino, which is the lighter, stainless steel, clean Morellino. Most producers should produce one line with high yields to be drunk quickly. Then, if they can, they should look to whatever cliffs or hills they have within their properties and try to develop those. That’s what we’ve done personally, and therefore we’ve pulled out two very different Morellinos. 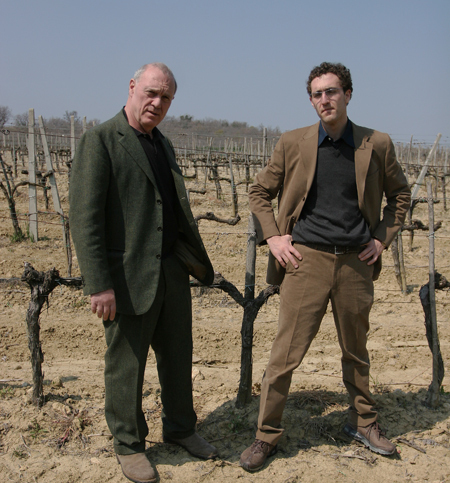 Is your base Morellino grown on the plain? My base Morellino is a clean, stainless steel, easy-to-drink, in-the-valley Morellino. It’s 15 hectares right next to the Albegna river, the sulfuric river that comes from Saturnia. It was once navigable to the point where we have our vineyards, so it was the site of many battles in Etruscan times. The [Etruscan] town of GHIACCIO FORTE, after which our wine is named, is actually an abandoned city—actually a tiny city state on top of the hill—right next to our house and cellar. That face that’s on the Ghiaccio Forte label is actually a statue we found in a tomb that our tractor fell through in the field next to the river. So that head is an original Roman sculpture left in the tomb, which we photographed and turned into that stamp. Exactly. There were 12 city states. The one that ruled Scansano was in Sovana. But there was Viterbo, Tarquinia…. Each one was a city-state under a confederacy that was broken by the Romans. So Scansano was always a super important place. By the 1800s, the wine from Scansano already had a good reputation, correct? It was. In fact, here there’s the culture of the cantina aperta after the harvest, which is a very ancient culture. In Montalcino, it did not exist. Even though Brunello di Montalcino was the first DOCG in Italy, it was noble people making wine for themselves. Whereas in Sansano, there’s a 400- or 500-year-old culture of making wine, especially for Grossetto [the regional capital]. During the period of malaria, Scansano was a summer fall-back, [a summer residence for] the town government of Grossetto and all the nobility. And nobody was going home without a barrel or two. Some say there were even French negociants in Piedmont who would come down in the period of the September/October cantine aperte to buy the so-called ‘cut’ wines, or wines to perfect their blends. So there was a whole industry. You can see a structure for that industry today in these vaulted cellars facing the street. These were made for people to meander through the streets, taste the wines, and decide what lot to take home for themselves, to add to their wines or as a freestanding wine. Morellino di Scansano has to contain at least 85 percent sangiovese. Today on the market, you find both blended Morellino and those with 100 percent sangiovese. Would you say that the majority of Morellino is still a blend? Yes, 99.9 percent is blended. That’s because the nights in Scansano are not as cold [as inland], so the wines are not as structured. If you were make a 100 percent sangiovese that would stand alone and distinguish itself, it would take a lot of work in the vineyards: how you plant, where you plant, what clone. It would take years to get to a monovarietal that’s really working in this climatic situation. Let’s say that [in Scansano] sangiovese does very well—all the clones of it—in general. But to really fine-tune that, to make a Flaccianello or a Brunello or a great sangiovese—takes a lot more studying and a lot more homework than we’ve done so far. Do you think the potential is there? The potential is there. It’s about picking the right areas. For instance, sangiovese doesn’t like to be really close to the sea—the salty air. The bottom line is, it’s the way the producer works: the way you take care of your fruit, how much fruit you leave on the plant, and what mother nature has done that year. I’ve seen sangioveses coming out of Scansano the past three years that are comparable to those of Montalcino. What are you using in your Morellino blends: French or indigenous grapes? My base Morellino is sangiovese/cabernet 85/15. The sangiovese is a valley sangiovese, so it’s 40-50 meters above sea level on flat lands. You farm higher yields; it’s really elegant, at 13.5% alcohol. It uses a nice, well matured cabernet, which usually comes in around 14% or 13.5% and does just stainless steel: really clean. People love it around the world. It’s a sushi wine in Japan, a steak wine in Argentina. My top-end Morellino is called Ghiaccioforte. It’s sangiovese from one single vineyard on a slope. I do much lower yields—30 percent lower—and two to three passes for harvest. I take care of that vineyard like crazy. I also have another little patch with 1-1/2 hectares of syrah. So it’s 12/88 syrah/sangiovese. It got 5 Grappoli [the top rating from the Italian Sommeliers Association] this year. We’re hoping to get something above 90 pts from Parker this year. I’m trying to make it a big success. I’m trying to make one of the great wines of Scansano. If Scansano reminds me of any other wine country in the world, it’s Australia. It smells like Australia. And our syrah is strong and peppery; it’s big syrah, not something you could leave by itself. You have to settle it down with the sangiovese. The wine is perfect with 88 percent sangiovese and just this little added spice. And about Syrah: The Etruscans come from Syria. See what I mean? They come from Turkey, from Asia Minor. So probably, the grapes they were bringing with them were most likely syrah [which many researchers speculate originated in Syria]. There’s no data on this. But having put these thoughts together, I’m seeing if it works. This vineyard, now 12 year old, is yielding beautiful results. The Ghiaccioforte 2009, for which we just got the 5 GRAPPOLI, sold out in three months. The last one before was in 2006. We make it only in great vintages. Even though the market for Morellino is currently as a chic alternative to entry- and mid-level Chiantis, it’s going to become a wine that’s looked to for its highest expressions, on a producer-by-producer basis. Is your father retired from the winery? He’s a painter! So he’s in the studio. Before me, there was a manager who ran it for about 18 years before I took it over. I’m 28 years old, and I started at age 20. So I’m just learning! In the past 10 years, [the Scansano estate] has given us so much satisfaction that we actually spend more time there than in Montalcino. It’s a fun area to be. There’s horseback riding, there’s cowboys. It’s very much undervalued. It’s also off the beaten track. It certainly is, even though it’s just an hour-and-a-half from everywhere, except the sea [just 10 miles away]. But an eno-gastronomic tourism is starting to make its way there. There are lots of jewels mixed in, between the history, the art, and the towns. And there’s lots of beauty. Everything seems to be a slightly more vivid color compared to the rest of Tuscany. Especially Chianti. I was in Greve the other day, and it seemed so dark and shadowy compared to the Maremma, which is open to the sky, with rolling hills and valleys. There’s a luminosity to the light, and you can smell the sea. There’s something very special about this area.